supports our work to create more survivors. In 2016, Susan G. Komen Greater NYC invested $697,589 in Komen HQ’s internationally recognized Breast Cancer Research Program and invested $1,368,699 in 24 community partners who deliver life-saving services. In total last year Komen Greater NYC provided breast health services to 54,728 underserved New Yorkers throughout NYC’s five boroughs, Long Island, and Westchester and Rockland counties. This year we provided 5,517 mammograms and 6,544 clinical breast exams, along with 16,311 support services (psychosocial, legal services, meals, transportation, etc.) and 26,456 educational services. Learn more about our community partners. Yes, Komen Greater NYC funds Planned Parenthood. WHY? Planned Parenthood is uniquely capable of delivering critical breast health services to women who may otherwise NOT get care. In 2016, we gave $63,750 to Planned Parenthood of Nassau County to link more than 5,000 medically underserved women of color to vital breast health screening and educational services they need. Komen funding to Planned Parenthood is for breast health services only. Under no circumstance are Komen funds used for non-breast health services. The breast cancer movement grew from Suzy Komen’s experience with breast cancer at a time when there were few resources and support systems for women and men going through the disease. Pink became the color of the movement over time, but this fight is about more than a color... It’s about the men and women who fight this disease every day. We focus on what pink has made possible — raising funds to invest in research and programs that have helped so many, and creating a community for breast cancer survivors and thrivers. This community is more than a ribbon, and it’s much more than pink. Research shows that 89% of consumers would switch brands (if quality and price held constant) for one that’s affiliated with a charity. Komen NYC adheres to NYS Attorney General’s guidelines related to “pink-ribbon” marketing. Susan G. Komen is a respected 3-star Charity Navigator charity. 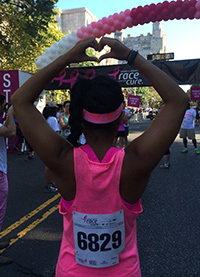 Susan G. Komen Greater NYC is one of 100 affiliates throughout the U.S., and NYC is the number one affiliate. Komen is the only breast cancer organization that not only funds research but also has a robust network of Affiliates working to ensure equal access to breast cancer care for all issues. Komen’s emphasis is on both research and health equity. It is highlighted often throughout the internet that Komen spends ONLY 20% of its revenue on research leading many writers to then FALSELY assume and assert that the remaining 80% is funding executive salaries and administrative/fundraising expenses. This is unequivocally not true. Former Komen President and CEO Dr. Judith A. Salerno received a salary of $475,000 annually. This is well below the salaries of like nonprofit CEOs. Komen founder Nancy G. Brinker moved to a volunteer role in 2015 and does not receive a salary. From inception through fiscal year 2016, Susan G. Komen has invested $160 million in metastatic research and $110 million in Triple Negative, Inflammatory and Luminal-B breast cancer research. Today, we know that the majority of breast cancer deaths are from metastatic breast cancer and that the aggressive forms of breast cancers above are more likely to recur and spread, so we are focusing our efforts in these areas. We’ve invested in metastatic breast cancer research for years, but we’ve also learned that it’s important to fund along the entire continuum — from prevention through survivorship — because it all contributes to a body of knowledge to end breast cancer. Funding more research into the biology of breast cancer, for example, can inform our understanding of metastatic disease and lead to advances that could prevent metastasis and/or improve outcomes for those living with metastatic disease. Komen Greater NYC is always trying to bring greater attention to the metastatic community. We have updated language throughout communications to include both survivors and thrivers. Our Hope Village program honors a Stage IV thriver at the Race for the Cure, and racers were able to check out Pfizer’s Story Half Told booth to learn more about mets. At the 2015 Impact Awards, Komen NYC honored Shirley Mertz, President of the Metastatic Breast Cancer Network, for her progressive work for the Stage IV community. Susan G. Komen announced that its Bold Goal, to reduce breast cancer deaths by 50% over the next 10 years. There are two ways you die from breast cancer — you don’t have the right care OR you die from breast cancer because we don’t know the biology of the disease yet. Our Bold Goal brings a heightened focus to those problems. 30% — The Right Care: Data shows if we can reduce disparities and increase access to care, we can reduce deaths by 30%. That’s where our grants come in. Komen is increasing access to and timely utilization of quality breast cancer care, and improving breast cancer outcomes through patient navigation. 20% — The Biology of the Disease: We can reduce the current numbers of deaths by focusing on better treatments for aggressive and metastatic breast cancer; detecting breast cancer recurrence or spread earlier; and detecting and treating breast cancer at its earliest stages. Let’s chat. Call our office today at 212-560-9590 and a Komen NYC representative will be happy to chat you through our work.